Debit card for online airline purchase? With the possibility of a financial windfall looming in the horizon (Christmas Bonus, represennnnnt!!! ), I have already decided that I am already way past buying new clothes and the silly little things that depreciate with time. I am setting my sights on moving to a new home, building a savings account and a travel fund. But of course, just because I am trying to be financially intelligent means I will forego my love of travel. Oh no. In fact, I consider the opportunity to get away as a reward as I set myself on the right path to financial freedom. 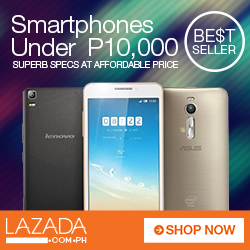 This definitely will work to my advantage since I have a BPI savings account that I am currently maintaining. 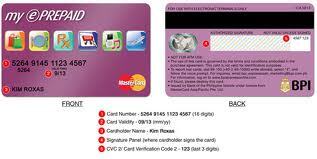 I can easily link one of my accounts and transfer money to put funds in the prepaid card. So far, the only drawback for me is that whatever money placed inside the prepaid card remains inside since the card has no withdrawal function. 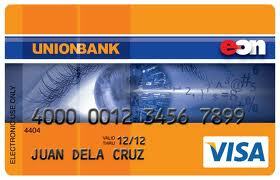 While I have a Paypal account, I am still wary of getting the EON Card. Firstly, this will require me to open a new bank account in a different bank, aside from the one that I currently maintain. As much as I would love to do this, maintaining one bank account is already a challenge for me and having to open another one would be too much I think for my brain to process (my brain automatically shuts down for anything that concerns numbers). Hopefully, I’ll have something figured out by the end of the month. I am really raring to start my travel fund and figured that the earnings I have from my freelance job can serve as a good seed money. I plan to use the debit card solely for purchasing tickets online. Obviously, many of the country’s budget airlines have been releasing a lot of online promos and I always get frustrated when I have to see ticket sale announcements and I have no means to purchase tickets. Paying over the counter is really much of a hassle, especially since I will have to drag myself to the airline’s partner merchants. I have never really gotten over the fact that I passed up on the chance to go to Japan last September. What made me more desperate is that I’ve found not a few people who tried their luck and was able to secure a visa, because they dared book a ticket. After seeing some of their pictures and hearing their stories, I became more determined to see my dream country next year. Who knows? This maybe a good start. What about you? How do you book your tickets? How to build your own travel fund. Now that the last traces of that amazing Hong Kong family weekend trip (read: the pictures have been posted, the story told countless times over; the remnants of the last pasalubong from KeeWah Bakery has been unwrapped and consumed) has finally faded, I go back again to a normal day where the most fun I had is the part where I plug this hideous speakers to my office PC and blast KPOP music to the whole office, much to the chagrin of the people on the cubicle next to mine. This early, I wanted to book tickets to Taipei or go back to Seoul or finally push for that long dreamed about Japan sojourn. Houston, we have a problem. My wallet is now empty and so is my bank account. I resolved to open a bank account just for traveling only. Something that I don’t have have to access for emergencies (like buying killer heels in the face of an important job interview), but something separate from OUR savings account intended for grown up stuff like bills, hospitalizations, unemployment and the quest for world peace. 1. Identify where you’re going. Do your research The cost of airfare, lodging and general expense differ per country. By having an idea where you want to go, you get a basic idea how much you should save up for it and for how long. For example, I know that choosing KL, Malaysia will set me back around PHP40,000.00 inclusive of airfare and lodging — this is an easy feat if I want to save that amount. Opting to go to Japan is a different story altogether. Aside from expensive plan fares, I also have to think about visa application where a good, solid savings account is included as one of the requirements. Having a time schedule or a chart showing the progress you’ve made will help too. You will be able to easily track the flow of money and see if you’re making progress against your goal. 2. Learn to give up your wants.And instead focus on your needs. Having a tall cup of frappucino daily is not a need. It’s a want. Imagine this, by giving up your designer coffee (PHP135.00 for tall cup x 30 days in a month), that’s PHP4,000 plus pesos savings in a month! You also don’t need to buy two colors of the same design. The usual “frazzled-stressed-day binge shopping?” — say goodbye to those. If you are annoyed, stay away from the malls or you’ll end buying stuff you’ll regret later. Buy what you need, not what’s cute. (<– I hope I'll be able to stay true to this!) Think of it this way, the money heading to this will go directly to your travel pot. 3. Lessen dining out Just because you’re saving and building your travel nest egg does not mean you’ll forever be consigned to brown bag lunches and Tuppeware’d bento boxes. Learn when to eat it and when to stay at the cubicle. The day after salary or when celebrating a special occasion is fine. Eating out or ordering in everyday is not. 4. If you can, find a way to earn extra. Money you earn from your part-time job, freelance work or consultancy job can always be split into three: travel fund, savings fund and spending money. This way, not only did you earn from part-time gigs but these jobs also contributed to both your savings and travel fund. 5. Learn to say “no” – you don’t have to be the girl who always says “yes” to everything: hanging out in a bar, shopping spree with friends, watching movies you don’t really like. You can choose the social activities where you’ll make an appearance and skip those that will either bore you or drive you comatose. Your friends will not abandon you just because you didn’t RSVP’d on their movie invite. If you think that these advises are a bit too common, note that these are the things that I plan on doing myself. I already made a mock-up note in excel for the proposed Taipei or South Korean map and plans on starting my save up plan as early as today. And oh, a word of caution. Please don not borrow money just for the purpose of traveling. 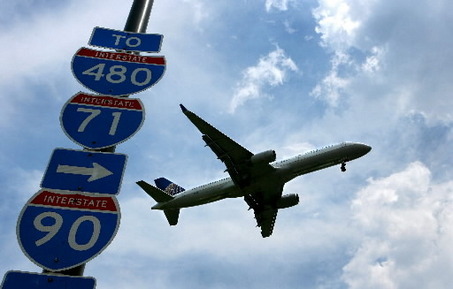 Travel only when able, otherwise…there’s always Google Maps to temporary satiate your traveling woes. 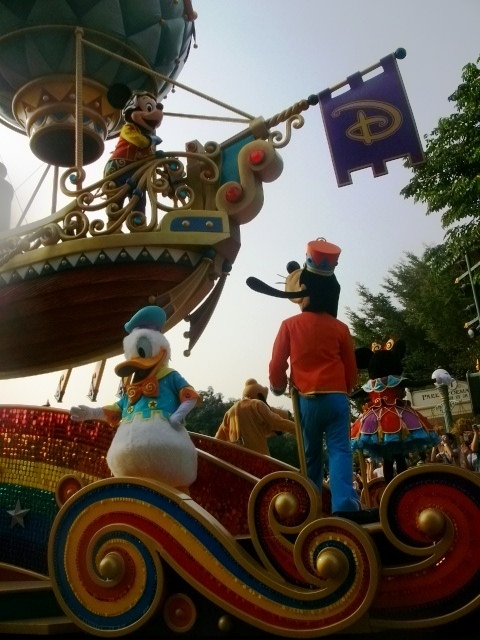 For me, a trip to Hong Kong won’t be complete without visiting Hong Kong Disneyland. 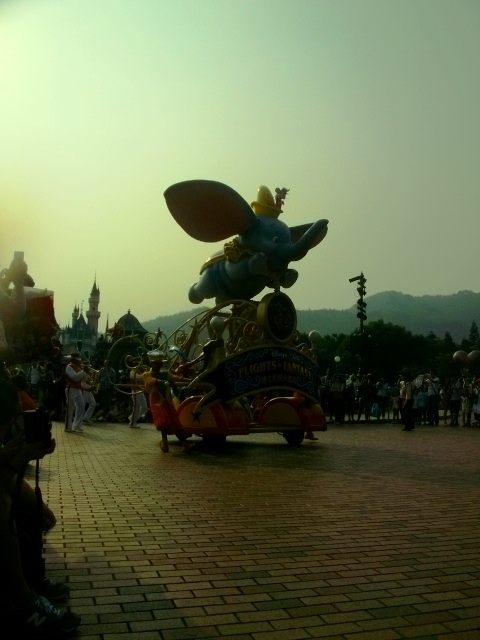 While I have been to Hong Kong thrice already, I still choose to go to Disneyland over Ocean Park all the time. I know I maybe missing out by insisting on going to Disneyland all the time but hey, the little kid in me is quite loyal to the Kingdom of the Mouse. Of course, playtime in paradise does not mean that there won’t be small things that threaten to put a damp on your happy camper kiddie mode. 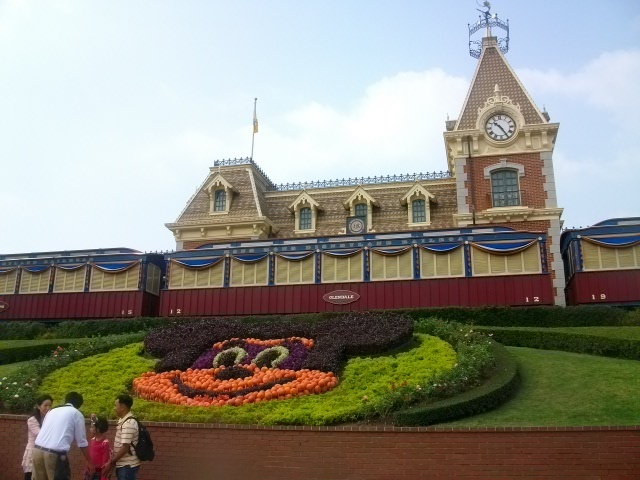 Here are some of my tips to maximize your stay at Hong Kong Disneyland! 1. Buy your tickets ahead – there are many ways to secure your Disney tickets ahead of time. 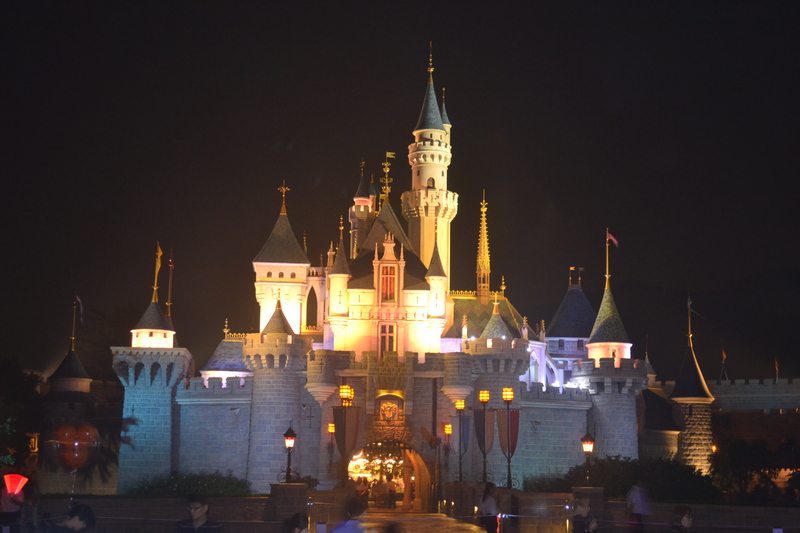 You can buy online through the Disney website, buy through recommended travel websites like AsiaTravel.com or choose to purchase your ticket through your hotel or guesthouses. 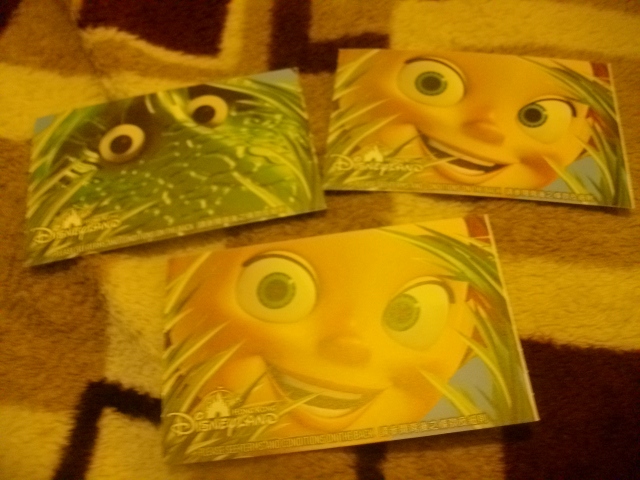 During our planning, I insisted on buying our tickets ahead of time and even asked the guesthouse if they were selling Disney tickets. Think of the long line you will have to weather if you ended up buying your ticket while on site. Good thing if it’s a slow day, but who can tell? Especially on the number of tourist groups and school field trips usually scheduled within the day. Buying it ahead saves you time — time which can be sent lining up on attraction. Plus, if you are lucky, buying your tickets ahead can save you money. In our case, we were able to get our tickets for just HKD380 (original rates at HKD399). I might be just HKD19 saved, but it’s money that can be used if you want to eat or buy something inside the park later. 2. Get to the park early and leave late (or at least, after the fireworks show) – When we first visited Disney, we arrived at noon and ended up missing a lot of the park’s attractions. The long line in all of the rides and shows didn’t help either. This time, with mom and dad in tow, we arrived at the park at 10AM just in time for the park opening. And since we have our tickets ahead, we strolled immediately to the entrance and started lining up for attractions and photo opportunities with the Disney characters. 4. Get your Park Map and schedules – Usually located by the entrance and at the City Hall, the maps will help you plot your way around the park, while maximizing your time in order to see the rides an attractions of your choice. The schedule meanwhile indicates the time where the characters usually appear for photo op, as well as the show schedules. For me, one of the biggest time eaters is the photo op with characters, lining up usually takes a lot of time especially if we are talking about Mickey and Minnie Mouse here. Knowing when and where they appear saves you the time and energy of lining up. TIP: Mickey and Minnie Mouse is usually found on the first gazebo that you will see upon entering the park. 5. FASTPASS – know it and use it to your advantage – Fast passes are tickets that will allow you to jump a line at a specific time period. 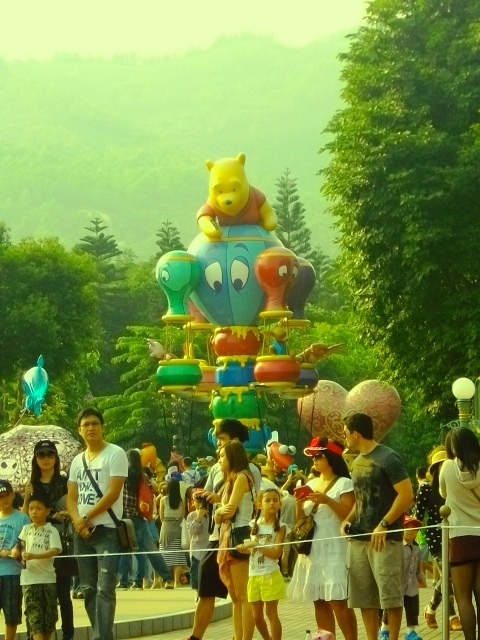 They are usually found on attractions that has a lot of crowd and lining up usually takes 30-45 minutes, like the Adventures of Winnie the Pooh. You can only use your Fast pass one at a time. To do so, you have to insert your ticket on a special fast pass machine which will print out your fast pass. You can only use your fast pass at the specified time period. 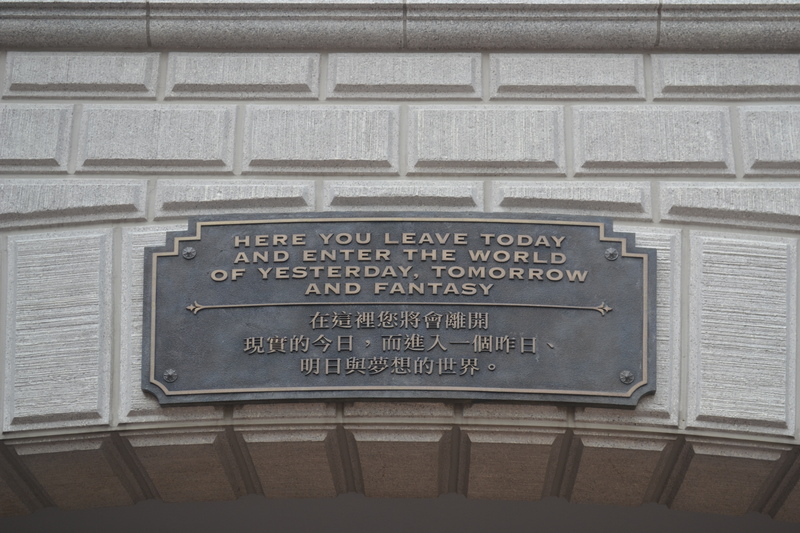 The Disney Cast Member will advice you when to come back. In the meantime, you can see other shows and enjoy other attractions. 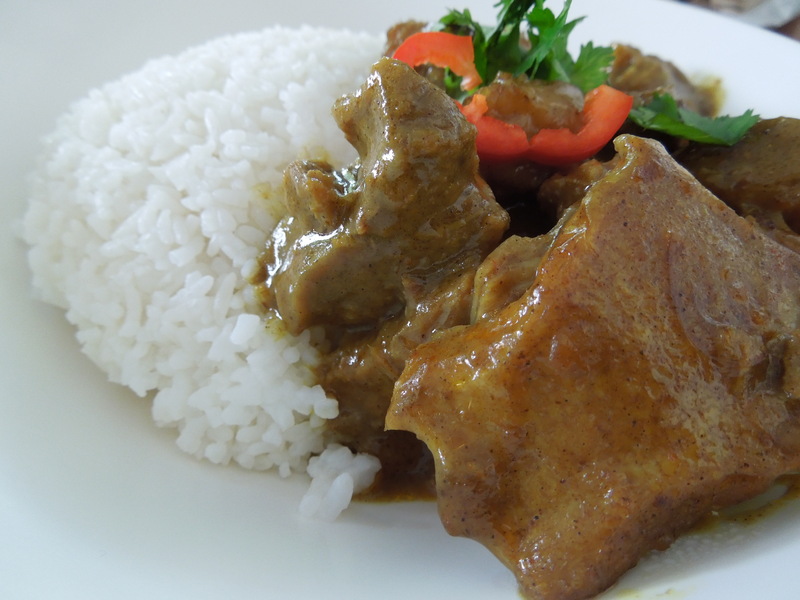 curry rice for only HKD46. 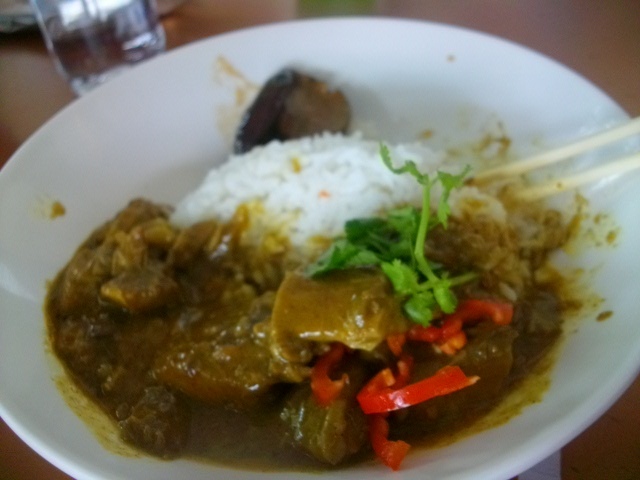 But even if you are on a tight budget, I would recommend to at least try one of the many dishes sold inside the park. We chose one of the food houses nearest Space Mountain and the food was to-die-for! Plus, at HKD46 per serving, it’s not as expensive compared to the other food choices inside the park. The servings are also huge! Will pretty much fill you up until late dinner where you have the option to splurge (read: eat at restos) or eat a light snack at the bakery over at Main Street and have a late dinner when you got home. 7. Patience at all times! – respect other people’s cultures and as much as possible try to be polite and patient, even if you think some people are rude. Nothing ruins the “magical vibe” more than a silly spat over standing in line! 8. Slather on SPF or bring an umbrella, especially if you are coming on a very hot day – It can be quite hot, especially when you are sitting on one of the curbs at Main Street waiting for the Afternoon Parade to start. Slather on SPF or bring an umbrella to avoid burning to a crisp. The parade can be quite long, and there are times when the giant floats stop moving to wait for the tail end to catch up. Skin cancer is not okay! These balloons are pretty! They also sell for HKD150 each. 9. Remember that you don’t have to see all the attractions and the show. Choose only what you like! – Life is too short to spend wallowing on rides that bore you to death (I am talking about you, Slinky Dog! ), no one will judge you if you insist on riding the Racer or Space Mountain four times! Remember, you are a kid — you play where you want to play! If you are in a group, you can agree to check out the rides you want and just meet up after a while on a designated spot. This works well of course, if you’re mobile phone is on roaming. 10. Don’t be a killjoy. 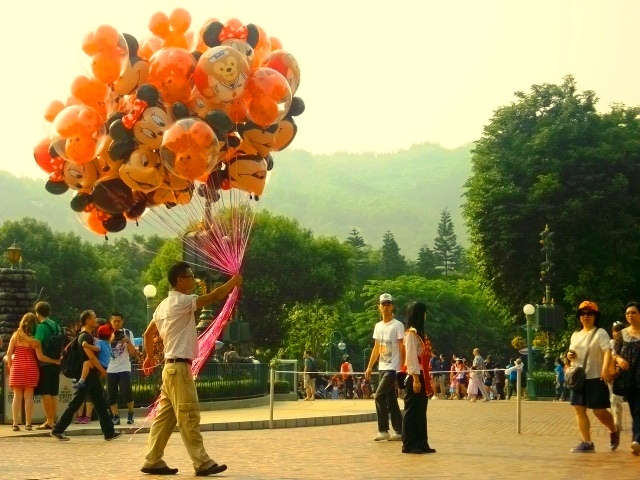 It’s okay to be a kid, even for just one last time – No one’s gonna judge you if you happen to morph back into your ten year old self the moment you see Mickey or Minnie or Donald. Relive your childhood by enjoying the rides, eating the junk foods, gushing over Minnie’s dress and telling Mickey you love him! Ride the carousel if you want or sing along to the theme of “Beauty and the Beast” at the Golden Mickey if you wish. Believe and be swept away by the magic of 3D at Mickey’s Philharmagic Orchestra. Lastly, if you feel like crying once the fireworks start dazzling the sky and the familiar refrains make your heart beat faster then ever, do it. Childhood is a wonderful thing where our worries are only limited according to our imagination. In one of my earlier posts about the Le Trip to HK with the Fam, I mentioned that I will include in this blog a breakdown of our expenses while in Hong Kong. I also posted a challenge to myself to keep the expenses down to Fifteen thousand pesos, inclusive of hotel and airfare (if possible). There is a reason for this post. I have always been hounded by friends and colleagues that I seem to have the bank account of a Hilton due to my endless meanderings. Truth be told, I have zero savings following the trip to Seoul in March and I even wonder on my capability to go out of the country in spite a very limited budget. I always tell myself this is because of my ability to find cheap deals and even wrote about how to spend cheap and still get to see new places. 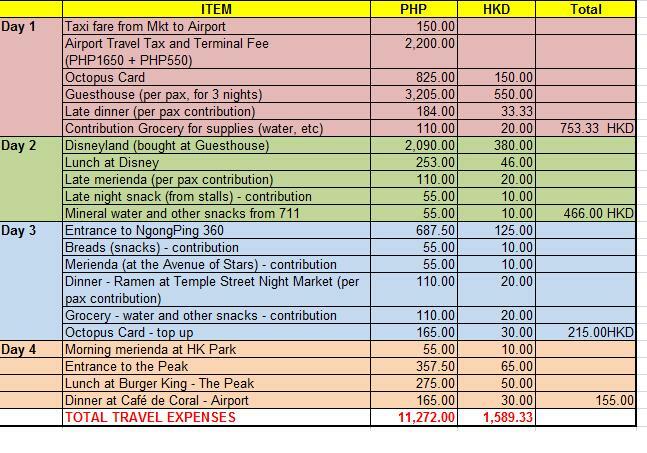 Well, we pretty much kept the budget below PHP15,000.00 for the whole trip inclusive of lodging, meal for three days and entrance to some attractions. We also included the budget for groceries for late night snacks and the Octopus Card loaded for HKD150 on our first day and topped up with HKD30 on our third day. We booked our tickets three months ahead via Cebu Pacific and was able to secure round trip tickets for six for just PHP24,000 or PHP4,000 per head, round trip. I don’t know if any of you had problems booking with Cebu Pacific using their online booking system, but we had to try a lot of times before we even get through the first step. Frustrated, we decided to call the Customer Service Hotline where a very patient agent handled our booking. A month and a half prior to trip, we booked our lodging through City Econo Guesthouse (see my review here) which I found after searching online. Since October has always been a “conference month” for Hong Kong, majority of the hostels and guesthouses I inquired in were all fully booked. City Econo Guesthouse is a highly recommended lodging at Pinoy Exchange and while reviews are pretty scant online, I decided to take a risk and reserved online. You will not be required a deposit, except the commitment to confirm your booking three days before the trip. I’ve always been curious about Nathan Road, that long stretch, starting from the boundary between Kowloon and HK Island and known for its numerous guest houses, hustlers, high end stores and malls as well as a melting pot of various nationalities. I have always been curious on the allure of its curious lights and the incessant noise, the buses careening through it. The aging buildings, housing a collection of guesthouses, girly bars, vegetarian restaurants and acupuncture clinics, had the beauty of decay and life mixed together. In spite the curiosity, I always chose to be on the safe side and booked a room somewhere in HK Island — first in Northpoint and the next, in Wanchai. 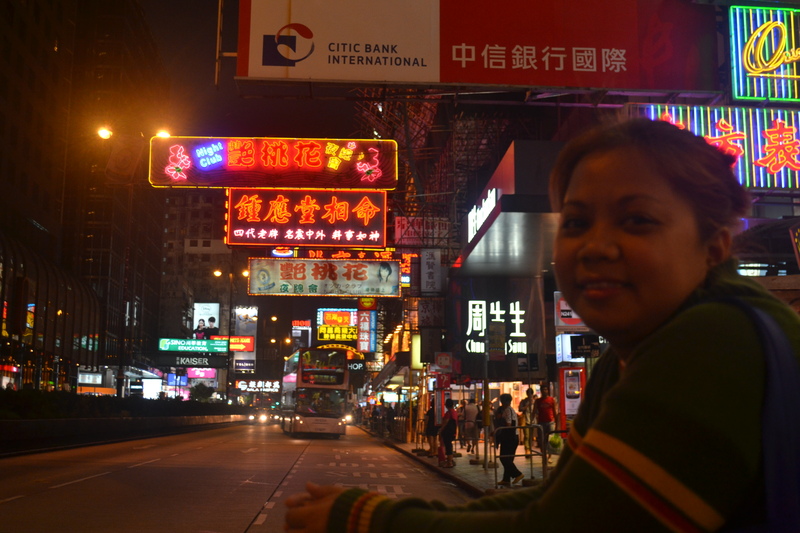 But for this trip, I insisted on staying in Tsim Sha Tsui, right at the heart of Nathan Road. I figured the parents will love the bright lights and the endless stream of people. I, of course, was right. Upon waking up, mum and dad would walk the long stretch and go around the block, enjoying the locals and the thrill of meeting an occasional Filipina. Near the guesthouse was many shops, both those catering to Western tastes but more interestingly, the Chinese medicine shops, the curio places, an old hole in the wall selling dumplings and xiao long baos and vegetarian snacks and a bakery selling goodies that would shame even Bread Talk’s best creations. These, and the amazingly cheap wares available made this a very good choice. While it is understandable that we will look for the usual things we eat back home (McD’s, KFC and the like), we have to admit that one of the best things about traveling is tasting delicacies that never get to find in our various localities. 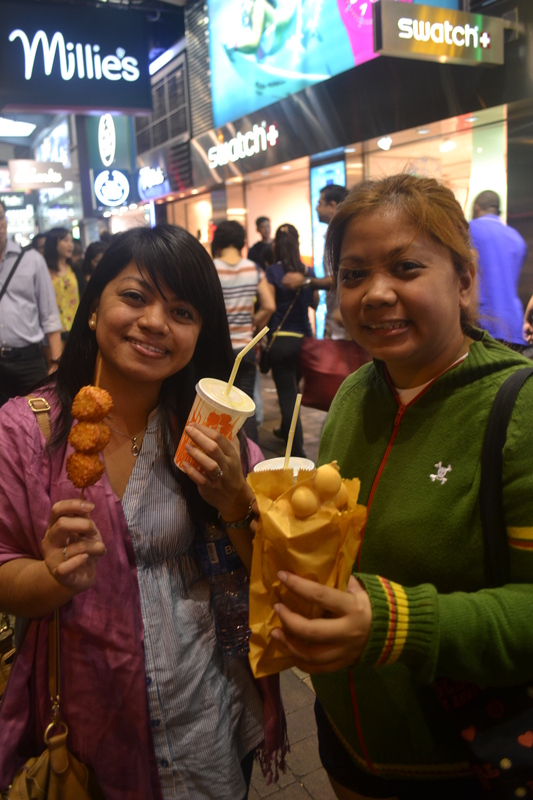 In HK, the family and I feasted on various offerings found in Temple Street Night Market. 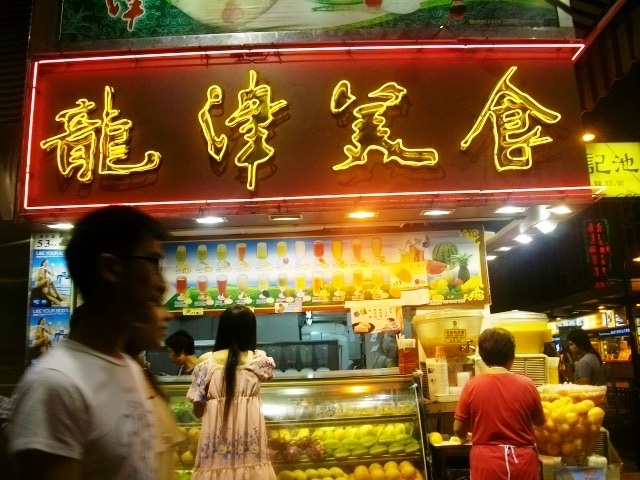 We also walked along Nathan Road and found a family-run place selling to die for fruit shakes. 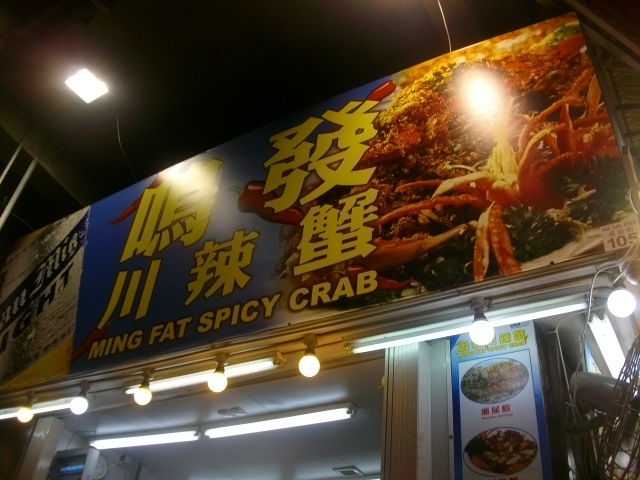 (This is near Tsim Sha Tsui Police Station) Beside it was a small establishment selling yummy fried scallops and fish balls. 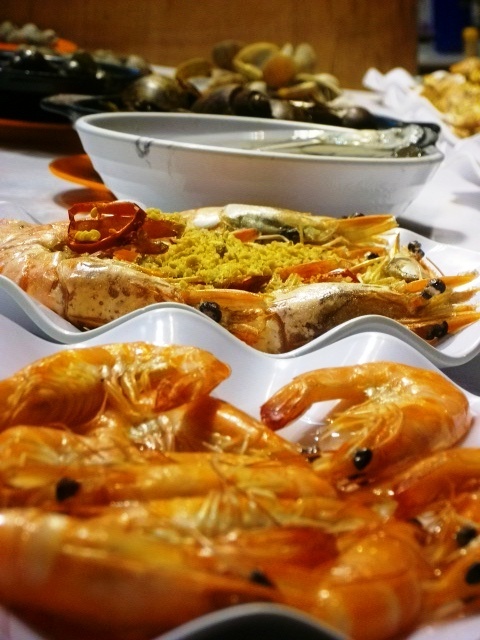 You can pick your seafood of choice and they will cook it according to your specifications. In the Philippines, we also have restaurants offering this kind of service. We call it paluto. 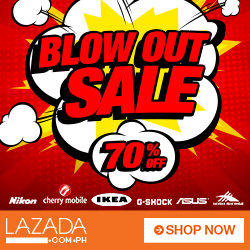 If we will factor in our plane fare, our total expense will go up to PHP15,272.00. Since it was a family trip, we really didn’t indulge in shopping. In fact, on our last day, I just bought a new wallet for HKD50 (less than PHP300) plus a Bruce Lee t-shirt for me and the hubby. I also made a quick trip to Ikea Causeway Bay to get a gift to a friend getting married in December. It was also a conscious effort on my part not to spend as much since the priority for our parents to experience Hong Kong. We were also able to see the places we wanted while ensuring that our elderly parents will get to experience the joy of Hong Kong. My parents, being children of older times when the Philippines struggled with poverty, were like kids in a toy store every time, especially when we brought them to Disneyland. It was truly worth it, the happiness in their faces while they line up to take their picture with Mickey and Minnie Mouse is truly priceless. On my next post: Why Disneyland brings out the kid in all of us.